A sliding glass door on the second level connects to a small deck stacked above the garage. Cloud sofa and ottoman by Restoration Hardware. 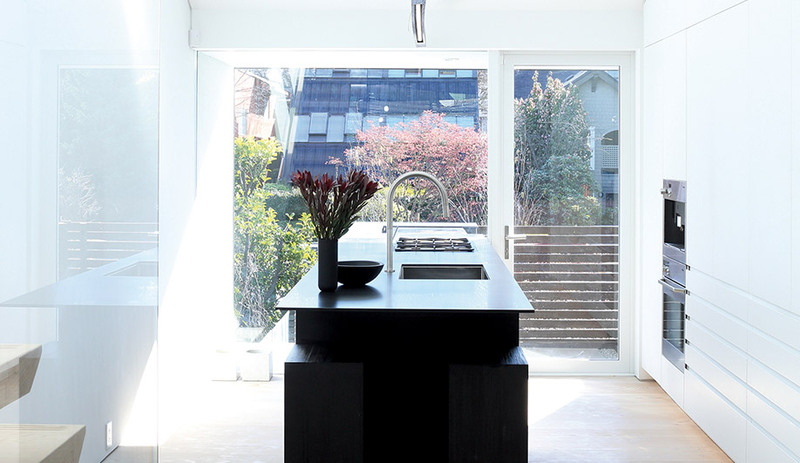 A custom-built kitchen island, topped in black Corian, offers a contrast to the overall white and blond wood interior. Faucet by Riobel, oven by Miele, fridge and stovetop by Gaggenau, and lye-dyed Douglas fir flooring by Dinesen. The kitchen, dining and living spaces occupy the second level. 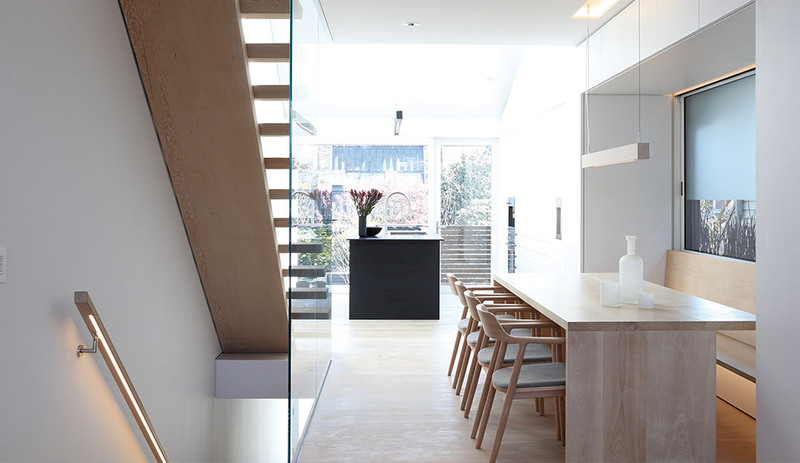 Throughout the house, the stripped-back aesthetic gains drama from underlighting installed around windows and embedded into stair handrails. 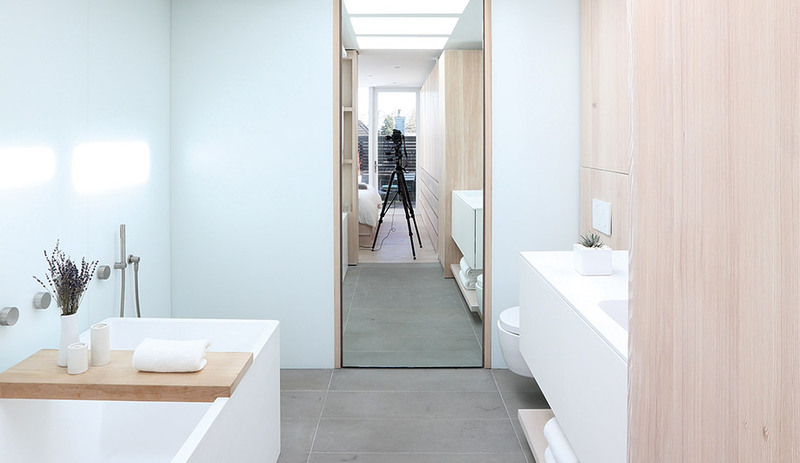 The ensuite features a box tub by Blu Bathworks of Vancouver. Faucets are by Fantini, and the tiles are made of sandstone. 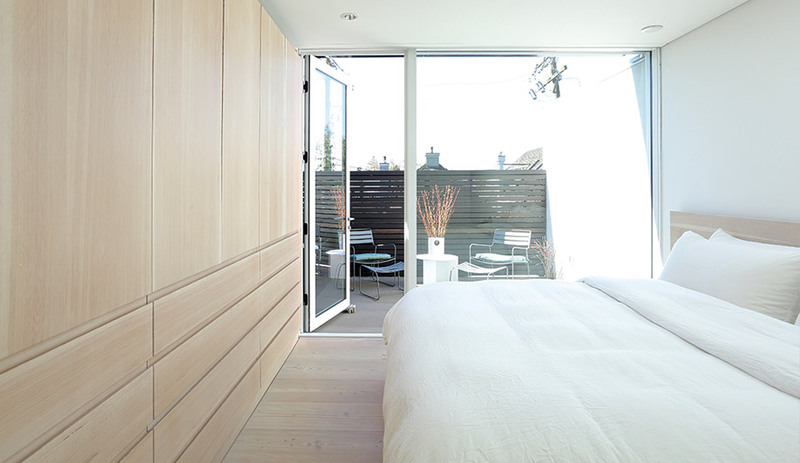 Vancouver architect Michael Green and his partner Sahra Samnani solve one of the biggest design challenges of our time: how to live large (and beautifully) with a whole lot less. Architect Michael Green has built his reputation on his advocacy for building towers out of engineered wood, and for his big-idea, civic-minded projects, many of which (including the North Vancouver City Hall addition and Ronald McDonald House) are in his hometown. His latest project is much smaller in scale but considerably more personal: the creation of his own home. In collaboration with his life partner, interior designer Sahra Samnani, Green effected a total transformation of a dowdy 1980 duplex, remaking it with glass, concrete, steel and slatted wood. Built on the south half of a 10-metre lot in Kitsilano, one of the city’s coveted beachfront neighbourhoods, the unit was in need of a massive renovation when Green purchased it a few years ago. At a scant 140 square metres, it is home to the couple and, for half the time, Green’s two teenage offspring. Its design ethos boils down to a few basic elements: simplicity, indoor/outdoor engagement, compactness and prolific storage space. Affordability, too – though, as Green concedes of the unstated budget, it cost “a lot more than we thought it would.” Rebuilt from the shell, the stick-frame structure has been seismically braced and spatially reinvented, its original floor levels and stairways obliterated. Changes included moving the side entrance to the front and rebuilding the gutted interior as three vertically stacked blocks of tightly organized space. 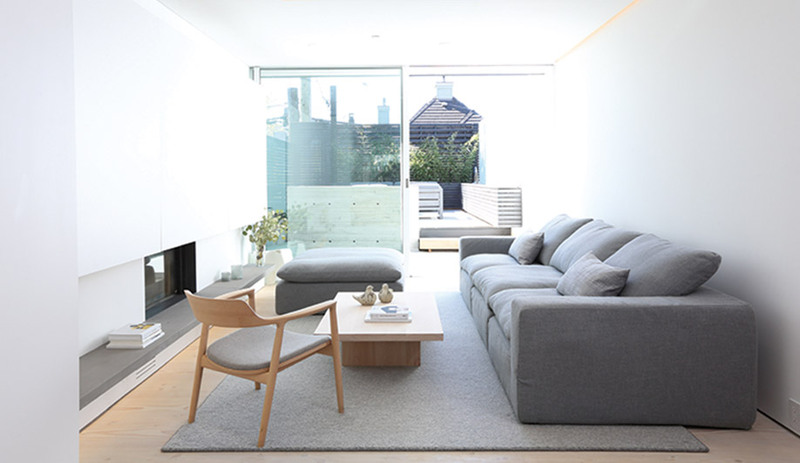 Ample storage space was key for down-sizing from a large suburban house to the 140-square-metre duplex. Visitors enter via a jogged, descending path, creating a sense of ritual. A micro-office, just inside the front entrance, serves as a kind of spatial sentry. It’s an approach Green has employed before – for instance, within his striking row of townhouses on Sixth Avenue. “Every building we do helps create a repeatable model,” he says. The rest of the ground floor is the teenagers’ zone: two bedrooms with adjacent bathrooms, plus a flex space that serves simultaneously as a music room, a hallway to the garage, and an egress to an outdoor, flush-to-the-wall pond full of koi and goldfish. From there, stairs lead to the second level, which contains the main common areas: kitchen, dining room, living room. 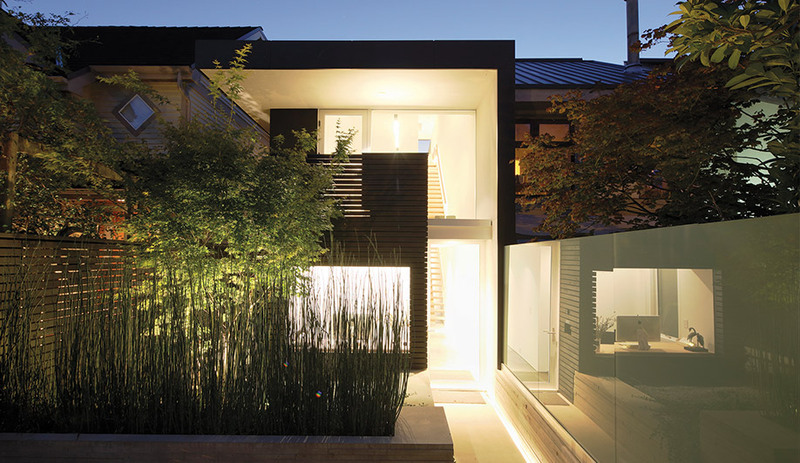 The aesthetic is spare, but underlighting devised by Samnani frames the bare walls, and horsetail reeds and stone bamboo planted outside soften the aluminum-frame windows. The expanse of white continues right into the working hearth, which also conceals a television behind white panels. Carefully detailed millwork defines and distinguishes the various zones within the open floor plan. 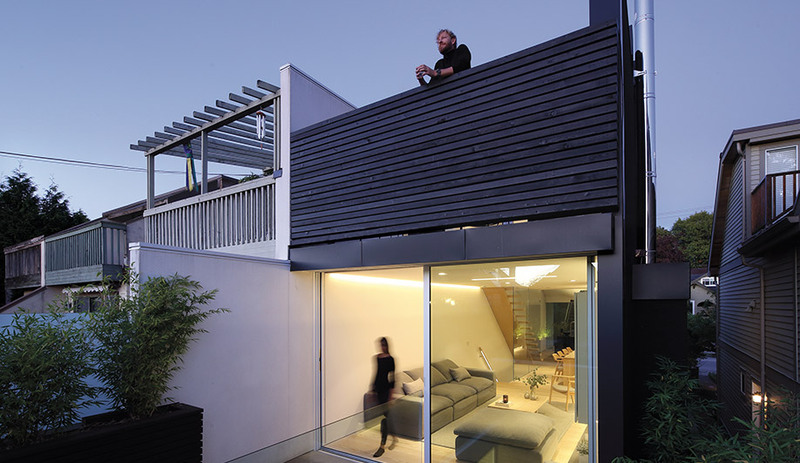 The living/lounge area leads to a small rear deck circumscribed by slatted wood fencing of strategic height, allowing both privacy and an artful view of rooftops. Presented through floor-to-ceiling glazing, the vista reads like a piece of wall-size light-box art. 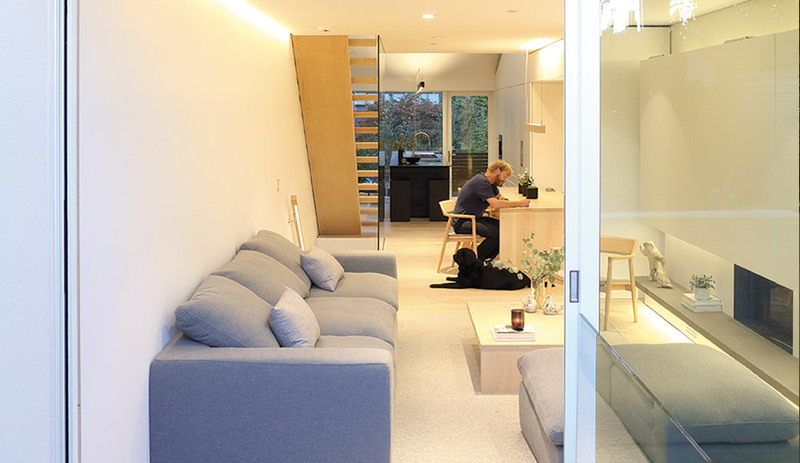 In downsizing from a 325-square-metre suburban house to a place less than half the size, Green had to purge his material possessions and devise a system of built-in cabinetry for the remaining stuff. The concealment of objects borders on the extreme: even when you slide open the bifold panels that hide the kitchen counter, there is nothing there but a bare Corian surface and an Omer Arbel-designed electric outlet. This is meta-minimalism. 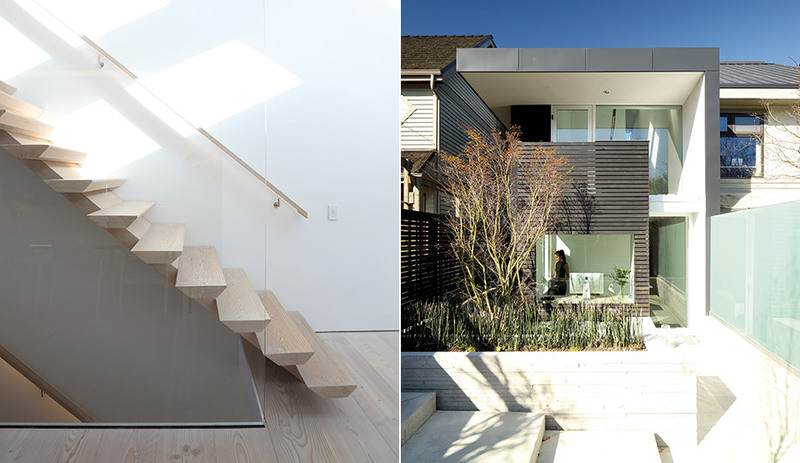 Left: An ultra-wide plank of Douglas fir serves as a stringer for stairs that lead to the third floor master bedroom. Right: Instead of the typical straight path to the front door, a stepped route jogs around an elevated garden bed. From the second floor, you ascend to the top-level master suite by way of the unit’s defining gesture: a Douglas fir stairway with a single, ultra-wide plank serving as its asymmetric stringer and sole structural support. In another gravity-defying move, the glass-walled master bathroom is rod-reinforced and structurally cantilevered – literally floating over the main living space below. With North America’s approach to housing currently polarized between monster homes and soulless high-rises, this mindfully designed home offers a more humane model for urban dwelling. “Quality of life for us now,” says Green, “is about reduction.” Dovetailing with that ethos, this house is not so much revolutionary as paradigmatic in an ever-densifying city: an elegantly compact model for a way of living that people of all demographics will need to embrace.